Lamb is one of our very favorite meats. While we cook it all year round we love the flavor of lamb cooked on the grill. This grilled lamb shoulder recipe comes from the folks at the American Lamb Council. I'd say if anyone knows how to cook a lamb, it's them. My husband and I made this lamb roast for a cookout we had last year. It was moist and flavorful, and best of all our guests who'd never eaten lamb before enjoyed it. We always like a change from the routine lamb recipes that call for garlic and rosemary. We think the mildness of the flavor and the sweetness from the marinade is one of the reasons this recipe is so popular. It's perfect for a cookout. 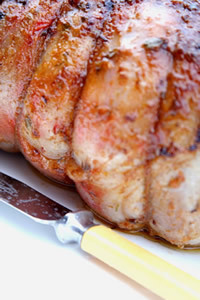 You should be able to find a boned and rolled lamb shoulder at your local supermarket. If not, the supermarket butcher can bone and roll a shoulder for you. Place the lamb in a glass dish. Combine all ingredients and pour over the lamb. Cover and refrigerate for several hours or overnight. Place the lamb on spit over hot coals. * Brush occasionally with marinade. Grill for 1 to 1 1/2 hours or until the meat thermometer registers 140 degrees (rare), 150-155 degrees (medium) or 160 (medium, well-done). Left over sauce can be heated and served over sliced lamb. * Our grill does not have a spit. We roast this lamb on our gas grill over medium-high heat. We baste it approximately every 20 minutes and turn the roast during cooking. We judge the doneness using a meat thermometer.